Ontario is accepting applications for the Seniors Community Grant Program from from January 28 through March 27. The $1 million program is intended to give seniors more opportunities to participate in their communities. Last year’s grants went toward projects to help seniors learn skills (such as cooking or mastering their iPads) and encouraging physical activity (including dance, lawn bowling and tai chi.) So far, the program has supported 179 projects and helped 43,000 seniors across the province. The Seniors Community Grant Program will support projects that allow seniors to contribute to all aspects of community life. Individuals representing non-incorporated seniors groups, incorporated not-for profit organizations, municipalities, Local Service Boards and Aboriginal groups are eligible to apply for Seniors Community Grants. As of 2015, for the first time, people over 65 account for a larger share of the population than children under 15. Learn more about the grants here. When the ice thickens on the protected harbour at the mouth of the Bighead River in Meaford, fishermen and women venture off the harbour wall and out onto ice shacks. There, they drop a line for the Rainbows below. But even if the ice isn’t quite ready, or you just want to try it out without investing in gear and a hut, you can experience the fun of ice fishing just west of Meaford. 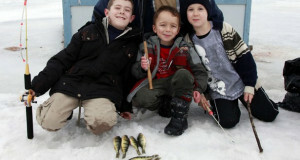 U Catch’em Charters offers ice fishing on their stocked pond during the winter months. It’s almost luxurious. Settle down in a heated fishing hut to try for Rainbow, Speckled and Brown Trout between 12″ to 24″. On top of that, you don’t need a licence, and there’s no limit. Cost is $50 per person, equipment and hut included. 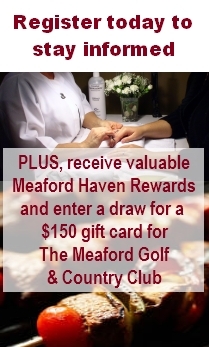 Location: 205572 Hwy.26 Call 519-538-5333 to reserve your time. Or visit U Catch’em’s website. Last time we introduced you to JoAnn McCall and Cirrus Hill Farm, and it’s heritage philosophy. Heritage breeds are the birds raised before industrial agriculture took over – carefully selected and bred to develop traits suited to the local environment, and to farming practices of a bygone day. They’re self-sufficient and mate and reproduce naturally. Cirrus Hill Farm specializes in Beltsville Small White turkeys, Saxony Heavy ducks, Khaki Campbell and Welsh Harlequin Light Layer ducks, Buff Orpington and Ancona Dual-Purpose ducks, Ancient Roman geese, Standard White Chantecler chickens, and, recently added, Heavy French guinea fowl (from Quebec, for grow-out only). Saxony ducks were also bred early in the last century – in Germany. “The Saxony is a very beautiful, productive large duck which grows rapidly on pasture, finishes a less fatty roasting duck of 4-5.5 lbs, and lays as many of their big, rich eggs as any heritage chicken,” writes McCall on the Cirrus Hill Farm website. “Eat them to save them” is the catchphrase of many heritage livestock and fowl aficionados, and Meaford’s Cirrus Hill Farm embodies this practical philosophy. A breeder and purveyor of heritage ducks, turkeys, chickens and geese, JoAnn McCall aims to “help rare breeds of exceptional merit survive for a secure future food supply… [and] see a large, viable local resource flock for each breed, in every county in Canada.” To that end, she sells live hatchlings, started birds, breeding stock and fertile eggs to those interested in raising the heirloom breeds. She also sells eggs and dressed birds to locavores, gourmets, restaurateurs and those interested in trying something different from the standard grocery store fare. 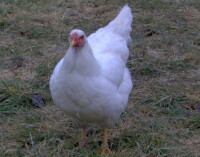 “Inspired by the French ‘Label Rouge’ program of humane, natural husbandry, and the traditional customs of regional French specialty producers, our market birds enjoy an idyllic chick-hood roaming at liberty on lush summer pastures, followed by a relaxed, species-specific finishing program to produce an exceptional gourmet product,” writes McCall on the Cirrus Hill Farm website. And Sarah Elton, author of the best-selling Locavore: From Farmers’ Fields to Rooftop Gardens” visited Cirrus Hill Farm a few years back and wrote about this local treasure for The Atlantic’s website. More about Cirrus Hills Farm next time.